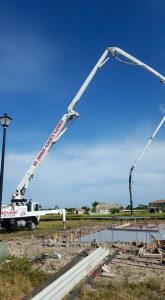 Big Johnson Concrete Placement, LLC is a family owned and operated concrete pumping business based in sunny south Florida. With over thirty years of combined experience in concrete pumping we have the knowledge to ensure a successful and safe pour of any size. Whether you build residential houses or downtown high rises we can supply your boom pumping needs. With knowledge and experience our greatest asset is our service, consulting us on your next pour will save you money, time, and frustration. Service is our greatest asset. All concrete pumps do the same thing, but no other company does what we do, with 24 hour access to management you know that your needs are our priority. Our operators make up some of the most talented, experienced, and professional concrete pumpers in the nation. We have a rigorous training and ongoing evaluation program to provide the best quality concrete pumping professionals in the business. Safety is our top priority. Our drug free workplace policy and safety program can give you confidence that your pour will not be delayed by unnecessary injuries. Meticulously maintained and consistently upgraded fleet of Schwing concrete pumps gives you the confidence you need to know that when our pump arrives your pour will go smoothly. If you are interested in pricing or have any questions regarding the services we provide, please do not hesitate to call 772-220-3435.